Lush green grass, a long-standing staple for yards, can be pretty to look at and fun to play on, but surprisingly tough on the environment — primarily because those bags of trimmings produced after mowing take up space in the landfill. Grasscycling is a simple solution to the problem and involves nothing more than leaving your clippings on the lawn instead of disposing of them. The trimmed blades quickly and naturally break down, and serve as a natural fertilizer. It’s free, it’s easy, and produces no waste at all. Use any mower to grasscycle. If your mower has an existing collection bag, remove it and properly cover the chute where trimmings would normally fly out. 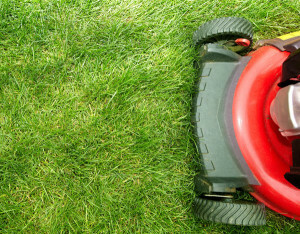 Cut no more than one third of the total length of the grass during each mowing. Your goal is to produce short clippings that fall in between the blades of grass. If your trimmings are too long, they will cover up your lawn, which may appear unsightly and prevent normal growth. Cut your grass frequently, especially in peak growing months, to keep your lawn and its trimmings at ideal lengths.